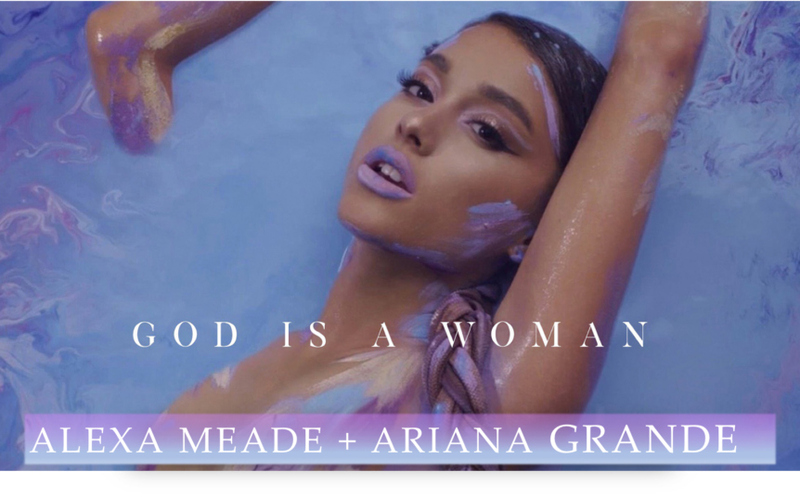 Alexa Meade’s inspirational collaboration with Ariana Grande for the music video “God is a Woman” has finally been revealed. In Ariana Grande’s video #GIAW, the latest single off her upcoming album “Sweetener”, director Dave Meyers (known for his work with Kendrick Lamar and SZA) was assisted on set by artist Alexa Meade. Alexa Meade’s vision was to have Ariana Grande swim in a sea of pastel colors. Alexa was inspired by previous work she’s done with Sheila Vand. The colors of purple and the simplistic, yet detailed work put into this music video has not gone unrecognized by the public. Alexa Meade is a mixed media artist best known for her portraits painted on the human body and set against painted backgrounds, that turn real life people into seemingly 2D works of art. She takes a classical concept — trompe l’oeil, the art of making a two-dimensional representation look three-dimensional—and works in an opposite direction. Her aim is to do the opposite, to collapse depth and make her living models into flat pictures. The result is walking, talking optical illusions, 3D paintings that confuse how the eye processes objects in space. Alexa Meade is available for corporate and private art installation projects and also gives lectures and keynote speeches. In corporate settings her work can be customized to incorporate attendees, who have opportunities to photograph themselves within the artwork, and post them for colleagues and friends through social media outlets. Within the art world, Alexa’s art has been exhibited at the Saatchi Gallery in London, The Smithsonian’s National Portrait Gallery in DC, Postmasters Gallery in NYC, and Galerie Ivo Kamm in Zurich, Galerie Ingo Seufert in Germany, and Galerie Edouard Mazel in Brussels. Alexa has delivered keynote speeches about her work at the Wired Conference, National Geographic, and TEDGlobal.